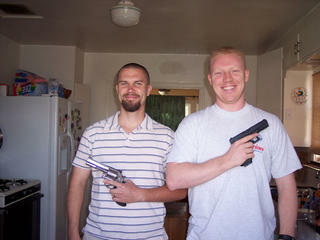 Here's Erick and Chris getting ready to go shootin'. Erick got his gun, a Smith and Wesson .357, a few weeks ago, and this was the first time he got to shoot it. Chris is a former Marine, so he is very concious about gun safety and also instructed Erick in proper cleaning of weapons. Of course we are going to be very careful about how we store this gun, especially with a baby on the way. Even when I look at the gun with a lock through the barrel and completely unloaded, it makes me nervous. But it is a nice weapon. Erick especially enjoyed the fact that the barrel smoked a little after a few shots were fired. Chris has a Luger, in case you're curious.